I remember learning how to make strawberry tiramisu when I was like 16...its very easy and quick to make! Not to mention, very light and delicious! I've always been fan of Italian cuisine and since Nine is based in Italy, I had to pair the two! Nine is a fancy and glamourous film, and I could have done a fancy Italian dish, but seriously, I had no time! Anyhow, the film is just something fun to watch, something you might wanna watch with your girls! Honestly, Guido's (main character) anxieties and stress was somehow getting to me, I couldn't help but feel for the character, but luckily his wife, his mistress, his muse, his agent, his mother and the actress made the film more pleasant and fun to watch. All the singing and dancing made me feel l was watching a live show! Loved it. You will surely fall in love with Guido's wife; played by the very lovely Marion Cotillard. I think I liked her character the most, but I liked Kate Hudson's singing! I had no idea she could sing (it's not amazing by the way haha, its just the song was catchy!). I felt like something 'solid' was missing in the story line, it just wasn't good enough, but then again it's a musical! So I guess the whole focus is the singing and dancing, which was top notch! I would not rate the film high, perhaps 3 out of 5? 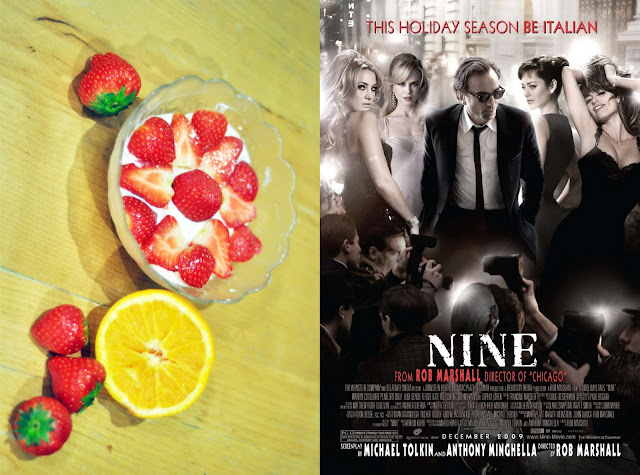 Eating the cool and light strawberry tiramisu while watching the film was a bliss! There are some beautiful scenery in the film, where Guido drives around beautiful Rome in the sunlight, next to a clear blue sea and the pretty Italian buildings, with neat and detailed architecture! If you've never visited Italy, either go or watch this film! First, you squeeze the oranges onto the ladyfingers (make sure you don't soak them in...) then you place the ladyfingers in a bowl or plate (whatever you desire). Then you mix the mascarpone cheese with the double cream, sugar and a bit of the vanilla sugar (I seriously can not give instructions on the amount of mascarpone or double cream you wanna use, but just make sure the mixture remains thick!) And the amount of sugar depends on how sweet you want to have it. Know that I am no chef or a good cook or baker! I just enjoy cooking and baking, and I love watching movies, so I am basically just sharing my love for the kitchen and films to you. Enjoy! i love your style and ive been following your blog for a while.